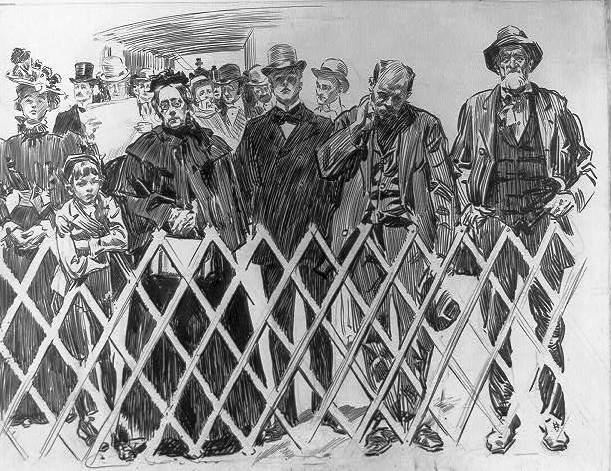 On November 7, 1895 when illustrator Charles Dana Gibson escorted his bride, Irene Langhorne, down the sweeping staircase of the Jefferson Hotel in Richmond, Virginia, he was already socially-connected with the architect Stanford White. But on that day Gibson was not thinking of White nor of architecture. He had first seen his new wife across the room at Delmonico’s while he was dining with friends. 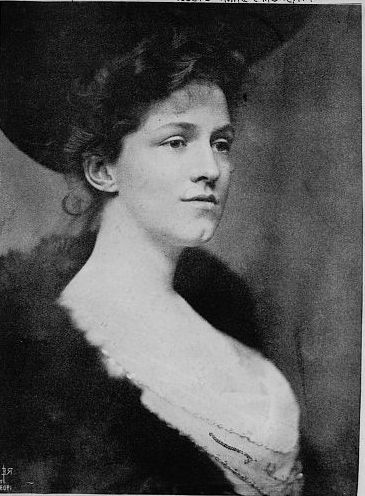 She was one of the five Langhorne Sisters from Richmond, known for their remarkable beauty even in New York City. A meeting was arranged for tea the next day. Not only would the meeting result in a successful marriage, but the beautiful Irene would be the prototype of many of the illustrator’s already-popular Gibson Girls. By the time the pair married, C. Dana Gibson had risen to the top of his field. 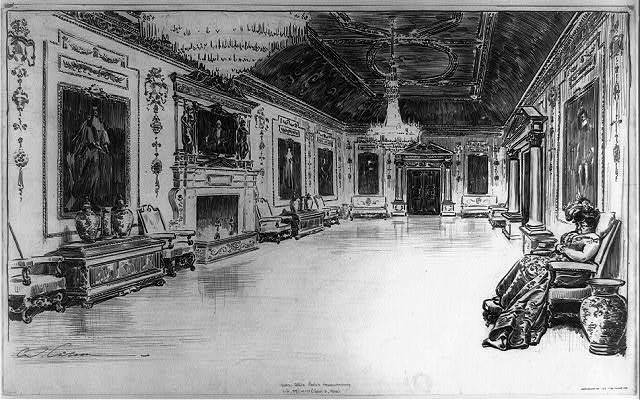 After attending the Art Students League, with classmates like Frederic Remington, he sold his first drawing to the humor magazine Life (not to be confused with the later photographic news publication of the same name) for $4. His insightful wit and ability to capture emotions, comedy and pathos of everyday moments made him instantly popular. By 1887 he was on staff at Life and by the turn of the century was earning $500 for each illustration. Seven years after the wedding, in 1902, Gibson commissioned Stanford White to design a home at 127 East 73rd Street. The block was filled with traditional, respectable brownstone houses constructed just after the Civil War. But as the neighborhood became more fashionable, one by one, these were replaced by more modern and elegant structures. A nationwide interest in things colonial was sweeping the nation and that fervor was reflected in domestic architecture in the city. 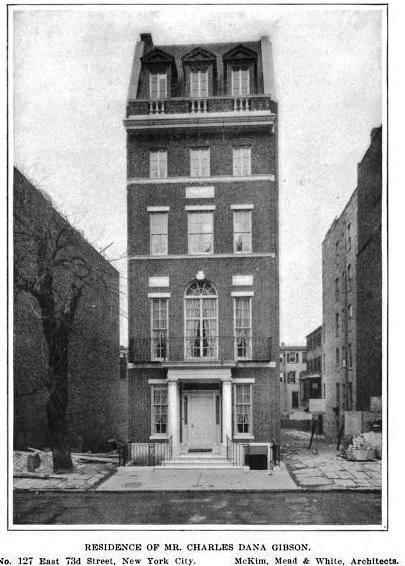 White was currently working on a house for Thomas B. Clarke in the neo-Georgian style; Andrew Carnegie’s immense brick and stone Georgian mansion was rising across from Central Park as was Paul Tuckerman’s colonial-inspired residence four blocks south of Gibson’s plot. White created a five-story residence, completed in 1904, that was both dignified and home-like. The red brick façade was trimmed in contrasting white limestone, drawing on both the English and American 18th century precedents. A stone portico supported by Doric columns was surmounted by an iron balcony, accessed by arched French doors on the second floor. Above it all, a stately mansard roof sat behind a stone and brick balustrade. The completed structure cost just under $50,000. 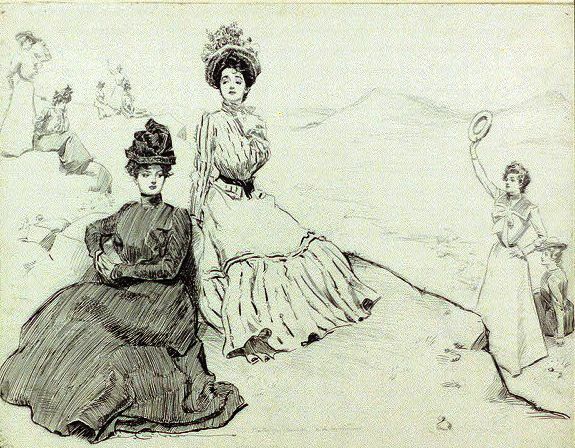 But for all the money the Gibson Girl brought him, the illustrator found the public’s obsession with her “slightly annoying.” Gibson was much more than that. His wit and satire were sublime and he was something more as well—he was an artist. In 1905, with the 73rd Street house completed and a summer estate being built on Seven Hundred Acres Island in Penobscot Bay, Maine, he left for Europe to study painting. The Gibsons were gone two years whe the Financial Panic of 1907 drew them back to the States. Gibson had invested in real estate and suffered financial losses. In 1908 the house at No. 127 East 73rd Street was leased and Gibson returned to illustration. His work was as popular as ever and he began rebuilding his fortune. Before long the Gibsons were back in the house. Tragedy struck the home on April 10, 1914. Irene Gibson’s sister, Elizabeth, was on a short visit while in mourning for her husband, Thomas Moncure Perkins, who had died just two weeks earlier. The women were still known in the press as “the Famous Langhorne Sisters,” all of whom had advantageously married, including Nancy who had become Lady Astor after marrying Waldorf Astor. Four days into her visit, at around 5:00 in the evening before she was to return to Virginia, Elizabeth was stricken with apoplexy. Less than three hours later she was dead. 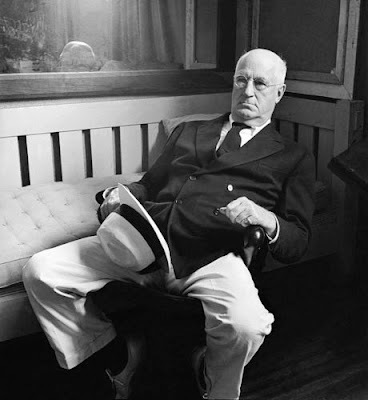 After World War I Gibson’s financial condition rebounded to the point that he purchased controlling interest in Life magazine, after the death of its managing editor, John A. Mitchell. Within a decade, however, he would dispose of his holdings as the popularity of the magazine waned with the changing social environment. Later, in November, the former Prime Minister of France, George Benjamin Clemenceau, arrived in New York to begin a lecture tour. Le Tigre, as he had become known because of his harsh line against the defeated Germans, was a guest of the Gibsons during his stay in New York. In the 1920s that may or may not have been a good thing. The Great Depression brought renewed financial problems and the Gibsons closed the 73rd Street house and moved into the Maine home. Here Gibson worked on his painting and in 1934 the American Academy of Arts and Letters staged a one-man show of 100 paintings. The New York Times’ art critic Edward Alden Jewell was impressed with the 67-year old artist’s work. 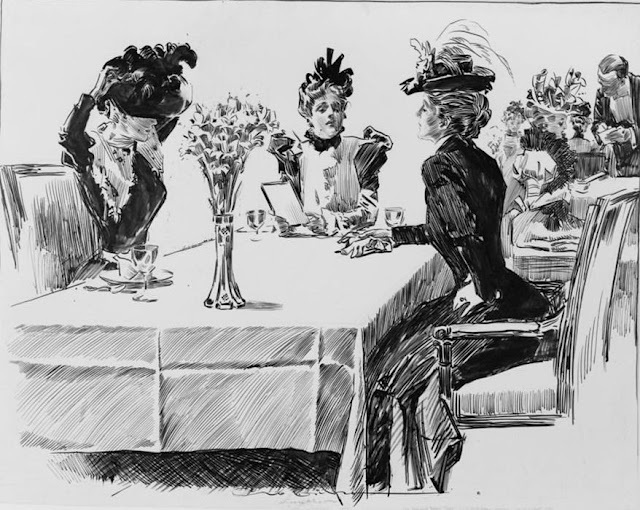 “Make no mistake about it, Charles Dana Gibson is a painter. He proves it again and again in a way the visitor is not likely soon to forget,” he wrote. The Gibsons enjoyed their life in Maine, far from the rush of New York City, and the house on East 73rd Street remained shuttered. The aging couple was termed by Life magazine “America’s most romantic couple” in 1942, the same year they decided to give up their Manhattan residence. The house, however, did not immediately sell. Then, in early September 1944 the 77-year old Gibson suffered heart problems. A United States Navy plane transported him to Doctors Hospital in New York; but he was soon removed to the house on East 73rd Street. While Irene Gibson sat beside his bed, the famous illustrator died of myocarditis on December 23, 1944. A private funeral was held in the house on the day after Christmas. Irene Gibson sold No. 127 West 73rd Street the following year. Before long it became home to the American-Scandinavian Foundation which, over the decades it was here, was less than loving in its interior preservation. Several rooms were modernized by stripping away the architectural details, creating sleek barren walls appropriate to 1950s and 1960s décor. In one area, Stanford White’s tile-and-marble floors were removed as were other significant architectural elements. The house was returned to a private home in 1999 when architect Thomas Vail was hired by the new owners to renovate the building. Using period photographs, Vail restored the lost floors, and installed copies of trashed interior columns and detailing. The exterior was restored, including replacement of the copper mansard roof. Robert Couturier would later execute another renovation, which House and Garden magazine termed “a perfect recipe for timeless chic.” The face-lift supported a selling price tag of $38 million in 2008. The refined home at No. 127 East 73rd Street is remarkable not only for its Stanford White design; but for the incredible and rich history of personalities connected with it. Many thanks to Dan Boyar for pointing out this amazing block. Whoever wrote this needs to do some proofreading and redo it. Irene did not die in 1914 of apoplexy. She lived many decades after that and basically died of old age. Shame on such a dreadful error in an otherwise interesting article. Re-read the article. It was Irene's sister, Elizabeth, not Irene who died. I - and my family of wife and three kids - lived on the top two floors of this house in the 1960s - 70s. In an abandoned back stairway - originally a passage for servants I assume - I discovered a few large dusty rolls of canvas that had been painted on the inside surface. When I tried to unroll them, they more or less shattered so I took them to the Met. I have no idea if they were ever restored, or even worth restoring. I assumed that they were C.D. Gibson rejects. I knew most of the story above, but not all of it. Thanks for the memories!